FilmJuice Competition: To celebrate the release of Dead Ringer we've got TWO DVD copies to Give Away! For your chance to win, simply answer this question (entry details at the bottom of page): Which star of Saving Private Ryan appears in Dead Ringer? 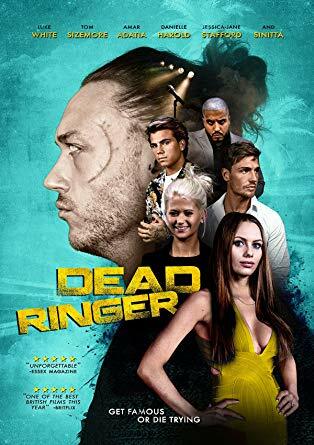 Dead Ringer tells the story of an imposter covering up an untimely death and is directed by the talented Richard Colton. The films all-star cast includes Luke White, DJ Tom Zanetti, singers Jordi Whitworth and Shide Boss, TOWIE’s Ricky Rayment and EastEnders beauty Danielle Harold as the leading lady. Alongside the sizzling Jessica-Jane Stafford, Lee Latchford Evans, Matt Lapinskas and Amar Adatia, with exciting cameos from Sinitta, Bai Ling and Golden Globe nominee Tom Sizemore. A modern day version of The Prince And The Pauper where one man from a poor background ends up taking over another mans life from the entirely opposite end of the spectrum. Jamie poulton – lead singer of tribute act Dive – gets the opportunity to replace the iconic Donny Martin from the boy band group D5 with ever gripping twists and turns. Could one man live in another mans shoes and actually get away with it? Director Richard Colton has an impressive filmography including Dangerous Game, The Rise and Fall of a White Collar Hooligan and Alien Uprising, as well as TV shows such as London’s Burning, The Bill, Casualty, Dream Team and Trial and Retribution’. Producer and Actor Amar Adatia’s first role was in the Bollywood hit Kabhie Khushi, Khabie Gham, with Chopra Town, Goal 2 and The Lift soon following. Adatia’s film slate includes Four Hours, Gangsters Gamblers Geezers, Retribution, Dangerous Game and now Dead Ringer. Many of which have gained worldwide releases. DeadRinger will be released on September 17th.